1. To prepare sauce, combine the ﬁrst 6 ingredients; cover and chill. 2. Preheat oven to 375ºF. 3. To prepare purses, arrange the squash and bell pepper halves in a single layer on a baking sheet coated with cooking spray; coat the vegetables with cooking spray. Sprinkle evenly with ¼ teaspoon salt and ¼ teaspoon black pepper. Bake at 375ºF for 40 minutes or until squash is tender, stirring after 20 minutes. Cool slightly. Thinly slice bell pepper halves, and set aside. 4. Reduce oven temperature to 350ºF. 5. Cook cumin seeds in a large nonstick skillet over medium heat 1 minute or until toasted and fragrant. Add oil to pan; increase heat to medium-high heat. Add leek and poblanos; sauté 8 minutes or until leek is tender. Cool slightly. 6. Combine squash, bell peppers, leek mixture, remaining ¼ teaspoon salt, remaining ¼ teaspoon black pepper, 2 tablespoons cilantro, and artichokes, tossing gently. 7. Place 1 phyllo sheet on a large cutting board or work surface (cover remaining dough to prevent drying); lightly coat with cooking spray. Top with another phyllo sheet; lightly coat with cooking spray. Gently press 2 phyllo sheets together. Spoon about 1 ¼ cups squash mixture into center of phyllo stack; top with 3 tablespoons cheese. Gather 4 corners of phyllo, and crimp and twist to seal, forming a purse. Lightly coat purse with cooking spray; place on a baking sheet. Repeat procedure with remaining phyllo, squash mixture, and cheese to form 8 purses. 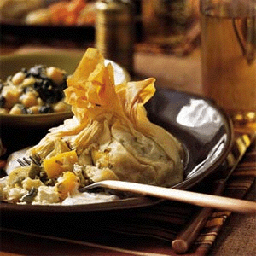 Bake at 350ºF for 30 minutes or until phyllo is browned and crisp. Serve with sauce.